UKC News - The worst kept secret in climbing? The worst kept secret in climbing? I wasn't going to write about this. But the beans are already spilled all over the place, mostly here. In short, and without feeding the gossip mill too much, the story goes something like this: Nalle Hukkataival watched Chris Sharma working on his, now infamous, project First round, first minute in Progression. He got psyched and, as the weather was bad where he was, he decided to go to Cataluña to try it. At that time, the project was open, and people were trying it. When Nalle got there, things changed however. All of a sudden, he was told the project was red tagged (closed). Nalle wasn't amused. Sure, there are plenty of other routes in the area, but this one was the reason he had come here in the first place. Obviously, there's more to this story, and hopefully Nalle will agree to a short interview in a couple of days. I'll also try to get a hold of Chris for his side of the story. That's often easier said than done however. For a great post about opening new routes, read this. 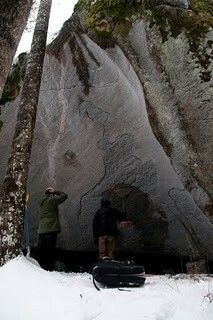 Photo: Nalle's slightly less famous project in the Finnish woods. I think it's safe to assume it's open.